Jessica and I are hiking the John Muir Trail which we will follow for 238.8 miles through 6 federally protected areas including Yosemite, Kings Canyon, and Sequoia National Parks. Before the trip we prepared a quick summary of our plans for each day. That way our parents curious folks can follow along. Use this link to see all of the posts. Today is day 8 of our hike. Today we are hiking from Reds Meadows to Duck Lake. Leaving Reds Meadows, we are beginning our easiest stretch on the trail. This resupply (our third) is five days long, but those five days are easier than earlier stretches on the trail. Only two are over 10 miles, and most have fewer hills to climb. I am hoping this will allow us to cruise into our rest day at Muir Trail Ranch. Jessica and I are hiking the John Muir Trail which we will follow for 238.8 miles through 6 federally protected areas including Yosemite, Kings Canyon, and Sequoia National Parks. Before the trip we prepared a quick summary of our plans for each day. That way our parents curious folks can follow along. Use this link to see all of the posts. Today is day 7 of our hike. Today is a big one! Fourteen and a half miles in nothing to shrug at. But, our packs are light and we are headed downhill to our next resupply and first shower (!!!) at Red’s Meadows, so our motivation should be high. Our day begins with tours of more incredible alpine lakes. Garnet shown below is a highlight, but so are Ruby, Gem, Shadow, Roslie and Gladys Lakes. After the lake tour, we trudge downhill for six miles towards Devils Postpile National Monument. DPNM protects a spectacular formation of columnar basalt. Only a slight detour from the JMT, we’ll be able to look at the impressive exposed section as well as walk on top! 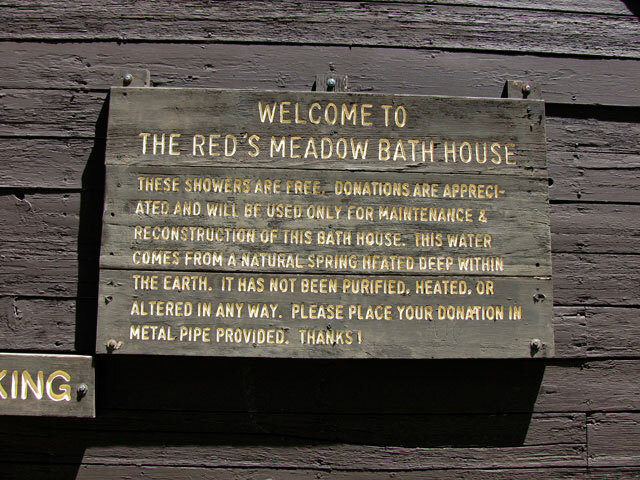 From DPNM it’s only three quarters of a mile to our next resupply and showers at Red’s Meadows!